Contributing over $635 million in cash receipts, grain and soybeans are an important part of agriculture in Virginia. Within the grain sector, grain storage (both on- and off-farm) has useful functions in the grain supply chain from farm to final consumer. For instance, at the farm level, it gives grain producers increased flexibility in determining where and when their crop is sold and contributes to faster harvest times. On the commercial side, elevators and processors expand the market opportunities for grain and facilitate its transportation. The purpose of this article is to examine the aggregate levels of grain stocks and capacity of Virginia’s off-farm grain facilities. The presented research offers a glimpse into the availability of grain and capacity at the state-level. On a quarterly basis, the National Agricultural Statistics Service (NASS) collects information on the levels of different grains and oilseeds on farms and commercial facilities (mills, elevators, warehouses, terminals, and processors). These reports provide the “grain stocks” as of March 1, June 1, September 1, and December 1 of a given year. The December issue (released in mid-January) contains storage data, including on- and off-farm capacity and the number of off-farm facilities. In Virginia, grain stocks held on farms for the different quarters are not released in order to prevent disclosure of information on individual operations, though most (around 60 percent) of the state’s total capacity is on-farm. Given the data limitation, the presented study is focused on commercial facilities. Capacity gives an overall metric of the volume available to store crops off-farm. From 1988 to 2013, Virginia’s commercial grain storage capacity experienced small fluctuations mostly between 30 and 35 million bushels(Figure 1). Beginning 2002 capacity fell below 30 million bushel for six year in a row and then begin climbing back to about 35 million bushels were it has been for the last two years. 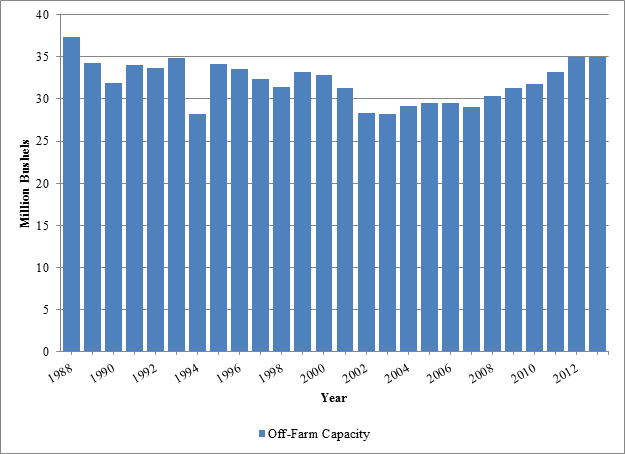 Figure 1: Off-farm grain storage capacity in Virginia, 1988-2013.Source: NASS Grain Stocks data. Examining the grain stocks, five crops, barley, corn, oats, soybeans, and wheat are held in Virginia’s off-farm facilities throughout the year. Corn, wheat, and soybeans are stored in the largest quantities. As expected, the quarterly release dates are somewhat reflective of Virginia’s harvest dates. For example, compared to the other release dates, corn stocks, a crop harvested from early September to early October, are at their greatest levels in the December report. Overall, with major contributions from corn and soybeans, December experiences the largest total grain stocks (barley, corn, oats, soybeans, and wheat) in Virginia (Figure 2). Importantly, the figure also shows that grain stocks are relatively low around June. 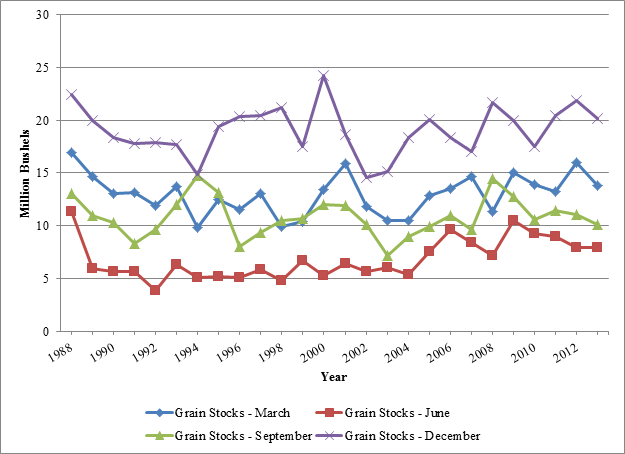 Figure 2: Grain stocks (barley, corn, oats, soybeans, and wheat) held off-farm in Virginia on March 1, June 1, September 1, and December 1, 1988-2013.Source: NASS Grain Stocks data. Figure 3 examines the highest (December) grain stocks against storage capacity, when the storage is most taxed in terms of volume. From 1988 to 2013, in the average year, grain stocks were 59.6 percent of commercial storage capacity on December 1. Storage was relatively constrained in 2000 and 2008 with grain stocks at 73.7 and 71.6 percent of capacity, respectively. With comparatively flat (December) grain stocks and recent increases in capacity (2007 through 2012), commercial storage has become less limited at the state-level in recent years. 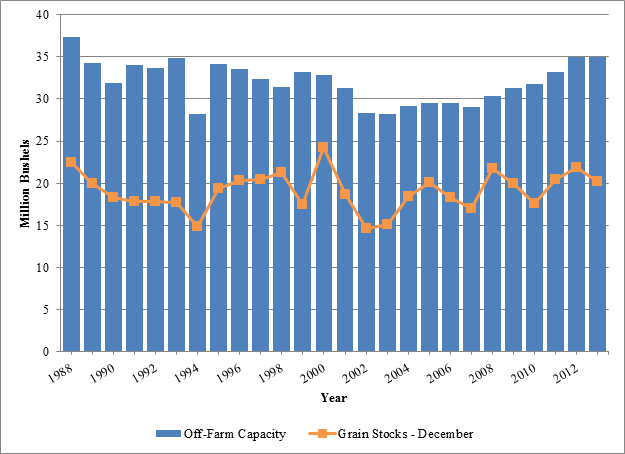 Figure 3: Off-farm grain storage capacity and December grain stocks in Virginia, 1988-2013.Source: NASS Grain Stocks data. Overall, some important observations may be drawn from this analysis. Commercial storage capacity has experienced annual increases since 2007 which leveled off in 2013. Of the five grains stored in off-farm facilities, corn, soybeans, and wheat are held in the largest quantities. Given its proximity to the harvest times of corn and soybeans, availability of commercial capacity is most limited around December. The availability of the grain itself, however, is most limited around June when stocks are low. Though off-farm storage in Virginia is most taxed in December in terms of volume, there still may be capacity available. Over the last five years (2009 to 2013), grain stocks occupied an average of 60.1 percent of capacity, which leaves around 40 percent remaining. As an important consideration, although 40 percent of capacity is not being used, some may be unavailable due to the storage of different crops in separate bins. For instance, extra space in a bin for barley is not available to corn, soybeans, or wheat. Thus, the difference between off-farm capacity and held grain stocks may overestimate the amount of available storage. Other limitations to the study include 1) a large amount of the state’s storage is on-farm and, since on-farm stocks are non-disclosed, this valuable information is not reflected and 2) the analysis does not examine regional differences in capacity constraints where some areas may experience greater storage limitations than others. Nevertheless, the analysis offers useful insight into the aggregate state of commercial storage in Virginia. Future research includes linking the analysis to other production data (such as grain prices and trends in acreage and production) and expanding the coverage to a regional level. Source: Virginia Department of Agriculture (http://www.vdacs.virginia.gov/agfacts/). Source: “Grain Storage Alternatives: An Economic Comparison,” available here: http://www.extension.iastate.edu/agdm/crops/html/a2-35.html. Source: “Can Grain Elevators Survive Record Crop Prices,” available here: http://www.kansascityfed.org/publicat/mse/MSE_0308.pdf. Source: NASS’ Grain Stocks, available here: http://usda.mannlib.cornell.edu/MannUsda/viewDocumentInfo.do?documentID=1079. Similarly, soybean stocks, a crop harvested from October to early December, are at their greatest levels in the December report. The September report shows the greatest levels of wheat, which is harvested in June and July. Source: Field Crops: Usual Planting and Harvesting Dates, available here: http://usda01.library.cornell.edu/usda/current/planting/planting-10-29-2010.pdf. This entry was posted in Articles, Uncategorized and tagged Grain, Storage. Bookmark the permalink.